PROJECT INDEPENDENCE. 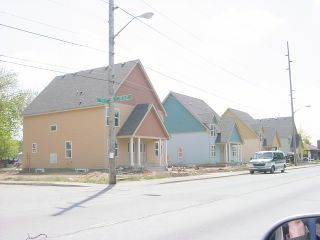 Four new doubles are being built on West Morris Street at Kappes Avenue to house young people who are aging out of foster care. It is a cooperative effort between the West Indianapolis Community Development Corporation and Mary Rigg Neighborhood Center. More than 1/3 of 18-year olds who age out of foster care become homeless within the first year. This community-based initiative offers housing, computer training, and supportive services until young people are economically independent and healthily interdependent in the community.